Science, Fantasy, and Science Fiction - ZineWiki - the history and culture of zines, independent media and the small press. Science, Fantasy, and Science Fiction was a science fiction fanzine edited by Franklin Dietz, Jr and published in Long Island, N.Y., U.S.A. The first issue appeared in April 1948, the second in July 1948. 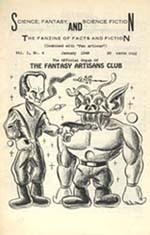 The third issue, released in October 1948, announced that Science, Fantasy, and Science Fiction was now the Official Organ of the Fantasy Artisans Club and was a split zine with Jerri Bullock and Russ Manning's Fan Artisan. The fourth issue, appearing in January 1949, had an announcement on the cover that the zine was now combined with Fan Artisan. At least nine issues were published. Issues 5, 6, and 7 were released in 1949, and #8 came out in 1950. The ninth issue was dated October 1951, but was not distributed until mid-1955. As the organ of The Fantasy Artisan's Club, the fanzine featured much artwork by some of the various members, who included Jon Arfstrom, Anton Beenders, John E. Blyer, Ken Brown, Lee Budoff, Jerri Bullock, Henry Chabot (Asmodeus), Ed Cox (Triton, Altair), Don Day, Michael DeAngelis (Asmodeus, Gargoyle (de Angelis)), Frank Dietz, Jr., Lester Fried, Jack Gaughan, Bill Grant (Canadian Fandom), Joe Gross, John Grossman (Scientifantasy), W. Leslie Hudson, Roberta Hesse, Addie Huddleston, Bill Kroll, Sol Levin, "Loki", Russ Manning, Jack Marsh, Howard Miller (Dream Quest), Ray Nelson, Al Paradis, Lee D. Quinn, William Rotsler, Harry Strunk, Albert Toth, and J. Henk Sprenger of the Netherlands and Ben Abas of Holland. Also included were articles, fiction and poetry by Richard E. Avery, W.C. Butts, Lin Carter (Spaceteer), Walter Cole, Franklin Dietz, Jr., W. Leslie Hudson, David H. Keller, Joe Kennedy (Vampire), Jay Klein, Bill Kroll, Sam Moskowitz (New Fandom), Alex Osheroff (Helios), John Quigley, Phil Sedley, Joe Schamuburger, Ken Slater, and James Taurasi (Fantasy-Times). Art work was featured by Jon Arfstrom, Ken Brown, Jerri Bullock, Walter R. Cole, Jack Gaughan, John Grossman, Bill Kroll, Sol Levin, Russ Manning, J. Henk Sprenger, and Harry Strunk. Franklin Dietz went to to co-publish Luna Monthly with Ann Dietz. This page was last modified on 8 September 2017, at 01:49.